LADCO works with our member states to maintain a regional air quality monitoring network. Deploying and operating devices that measure air pollution are fundamental activities in the protection of public and ecological health. 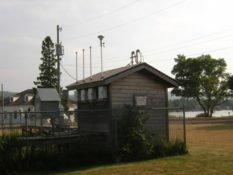 Isle Royale, MI IMPROVE monitoring site. LADCO works with our member states to ensure that the monitoring network in the region meets Clean Air Act statutory requirements and provides accurate and timely information on the concentrations of different air pollutants. Although we typically don’t operate the monitoring sites directly, LADCO’s work in this area focuses on identifying what should be measured, where to put new monitors, and analyzing data from existing monitors. Every 5 years states are required by the Clean Air Act to review their air pollution monitoring networks. LADCO coordinates the periodic monitoring network reviews for our member states. Click the links below to view the results of recent monitoring network reviews. Analyses of trends in the monitoring data are used by our member states to track the effectiveness of emissions reduction programs, demonstrate compliance with federal air pollution regulations and to explore the interactions between regional climate and pollution. In addition to working with the static surface monitors, LADCO has a history of facilitating and sponsoring targeted field campaigns to investigate persistent air quality problems in our region. Examples include the 20xx Winter Nitrate Study [add link] and the 2017 Lake Michigan Ozone Study [add link]. How can I access monitoring data? Visit the US EPA Air Monitoring Data GIS web app on the LADCO GIS-Mapping page to view the locations of air monitors in the U.S. and to download data for specific monitors. The Federal Land Manager Environmental Database (FED) is an online tool for visualizing and downloading data from many of the surface monitoring networks of atmospheric conditions. The U.S. EPA Air Data website is a portal for visualizing and downloading atmospheric composition data. Contact the LADCO Data Scientist for more information about monitoring air quality at LADCO.